Angry about the media’s polarizing coverage following the mass shooting at Marjory Stoneman Douglas High School in Florida, Andrew Pollack, the father of Meadow Pollack, who was one of the murdered students, slammed Fox News’ Chris Wallace for focusing on gun control rather than school safety. Pollack gave an emotional speech in front of President Trump at the White House during a meeting last week with parents and students affected by the shooting. He spoke passionately about his 17-year-old daughter and demanded that action be taken to ensure a tragedy like this never happen again. Pollack drew national attention last week for his emotional plea for action during a White House listening session about school safety with President Trump. On the day of the shooting, Andrew Pollack was photographed searching for his daughter, Meadow. Later that day Pollack said, “She’s gone” after finding out his daughter was one of the students that was gunned down by Nikolas Cruz. Hateful liberals hurled insults at the grieving father because he is a Trump supporter. 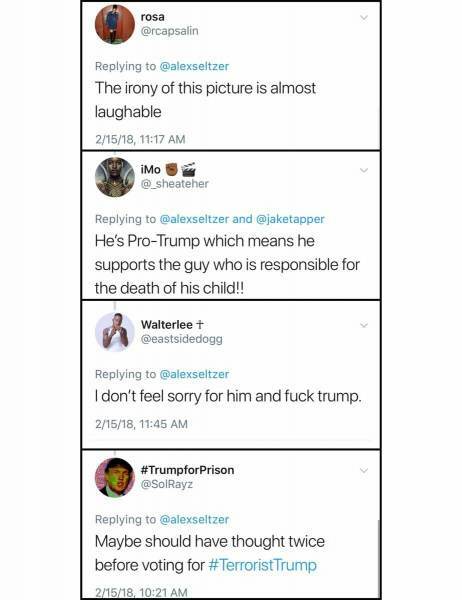 Some of the vile insults included tweets like, “I don’t feel sorry for him and f*ck Trump” and “Maybe he should have thought twice before voting for Terrorist Trump”. The weapon was purchased the year PRIOR to President Trump taking office – that would be on Obama’s watch, so Beryl is ignorant and cruel. It's true. I feel horrible for his loss… but his vote helped the killer purchase the weapon. It's going to sit with him and we're all going to have to rethink our politics. President Trump has promised to address school safety to ensure that students are safe, as well as review current gun laws. To begin with, he has proposed raising the legal age to buy a gun from 18 to 21.